Human Eugenics: Whose Perception of Perfection? Bruffee, Collaborative Learning: Higher Education, Interdependence, and the Authority of Knowledge, 2nd. ed. by John E. Leary, Jr.
Black, Eighteenth-Century Europe, 2nd ed. AP U.S. History: Beneficial or Problematic? Allen, Nathaniel, "The Times They Are A-Changing: The Influence of Railroad Technology on the Adoption of Standard Times Zones in 1883," 241-256. "Human Eugenics: Whose Perception of Perfection?," by Parendi Mehta, 222-240. Mehta, Parendi, "Human Eugenics: Whose Perception of Perfection?," 222-240. "Times They Are A-Changing, The: The Influence of Railroad Technology on the Adoption of Standard Times Zones in 1883," by Nathaniel Allen, 241-256. "Academic Professionalism and the Business Model in Education: Reflections of a Community College Historian," by Charles A. Zappia, 55-66. "Class Struggles: Teaching History in the Postmodern Age," by Shirley Wilton, 25-32. "Collaboration in History Teaching: Status, Problems, and Opportunities," by James J. Lorence, 79-89. "Collaboration of Two- and Four-Year Colleges, A: Reconceptualizing the Introductory Survey Course," by Noralee Frankel and Linn Shapiro, 91-95. DelGaudio, Julian J., "Should Historians Become Programmers? Limitations and Possibilities of Computer-Assisted Instruction in the United States History Survey," 67-78. "Educational Priorities and Challenges: Teaching History in Community Colleges Today-An Introduction," by David S. Trask, 11-24. Frankel, Noralee, co-auth., "A Collaboration of Two- and Four-Year Colleges: Reconceptualizing the Introductory Survey Course," 91-95. "Gems from Rough Stones: Teaching with Technology in the Two-Year Environment," by Laura G. Musselwhite, 33-39. "History Teaching at the Community College: A Preface," 9-10. Huehner, David Robert, co-auth., "Technology and Student-Centered Learning: The University of Wisconsin Student History Network Project," 41-54. Kallgren, Daniel, co-auth., "Technology and Student-Centered Learning: The University of Wisconsin Student History Network Project," 41-54. Lorence, James J., "Collaboration in History Teaching: Status, Problems, and Opportunities," 79-89. Musselwhite, Laura G., "Gems from Rough Stones: Teaching with Technology in the Two-Year Environment," 33-39. Shapiro, Linn, co-auth., "A Collaboration of Two- and Four-Year Colleges: Reconceptualizing the Introductory Survey Course," 91-95. "Should Historians Become Programmers? Limitations and Possibilities of Computer-Assisted Instruction in the United States History Survey," by Julian J. DelGaudio, 67-78. "Technology and Student-Centered Learning: The University of Wisconsin Student History Network Project," by David Robert Huehner and Daniel Kallgren, 41-54. Trask, David, "Educational Priorities and Challenges: Teaching History in Community Colleges Today-An Introduction," 11-24. Wilton, Shirley, "Class Struggles: Teaching History in the Postmodern Age," 25-32. Zappia, Charles A., "Academic Professionalism and the Business Model in Education: Reflections of a Community College Historian," 55-66. Briley, Ron, "What Do You Mean You Don't Do Advanced Placement? : Confessions of an Educational Heretic," 527-532. Chu, Jonathan M., "Preparing for the AP Exam: The Dangers of Teaching to the Test," 511-520. "Document Analysis as a Tool to Strengthen Student Writing," by John E. Stovel, 501-509. "Impact of the Document-Based Question on the Teaching of United States History, The" by Eric Rothschild, 495-500. 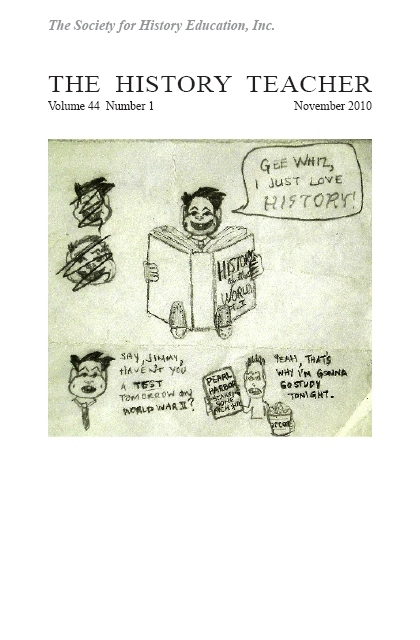 Lurie, Maxine N., "AP U.S. History: Beneficial or Problematic?," 521-525. "Preparing for the AP Exam: The Dangers of Teaching to the Test," by Jonathan M. Chu, 511-520. Rothschild, Eric, "The Impact of the Document-Based Question on the Teaching of United States History," 495-500. Stovel, John E., "Document Analysis as a Tool to Strengthen Student Writing," 501-509. "What Do You Mean You Don't Do Advanced Placement? : Confessions of an Educational Heretic," by Ron Briley, 527-532. "Affecting the Great Continuum of K-16 History Education," by Leon Fink, 297-302. "Ethnic vs. Evangelical Religions: Beyond Teaching the World Religion Approach," by Joel E. Tishken, 303-320. Fink, Leon, "Affecting the Great Continuum of K-16 History Education," 297-302. Forsyth, Louise, co-auth., "History Didactics in the Post Cold War World: Central Asia, the Middle East, and China," 425-451. Gould, David, co-auth., "History Didactics in the Post Cold War World: Central Asia, the Middle East, and China," 425-451. "History Didactics in the Post Cold War World: Central Asia, the Middle East, and China," by Louise Forsyth, David Gould, and David Lawrence, 425-451. Lawrence, David, co-auth., "History Didactics in the Post Cold War World: Central Asia, the Middle East, and China," 425-451. Tishken, Joel E., "Ethnic vs. Evangelical Religions: Beyond Teaching the World Religion Approach," 303-320. "Interviews with Exemplary Teachers: James O. Horton," by Roy Rosenzweig, 97-107. Rosenzweig, Roy, "Interviews with Exemplary Teachers: James O. Horton," 97-107. August, Andrew, "Reader's Journal in Lower-Division History Courses, The: A Strategy to Improve Reading, Writing and Discussion," 343-348. "Four Elements of Successful Historical Role-Playing in the Classroom," by Kathryn N. McDaniel, 357-362. Frost, Jennifer, "Integrating Women and Active Learning into the U.S. History Survey," 363-370. "Getting Undergraduates to Seek Primary Sources in Archives," by Marian J. Matyn, 349-355. Horton, Paul, "Model for Teaching Secondary History, A: The Case of Fort Pillow," 175-183. 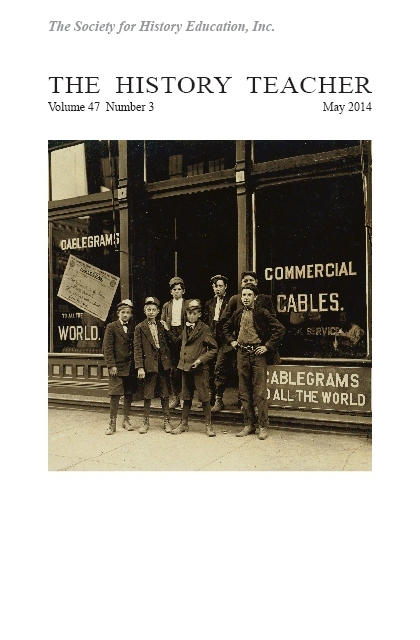 "'In Their Own Eyes': Using Journals with Primary Sources with College Students," by Susan Leighow Meo, 335-341. "Integrating United States and World History in the High School Curriculum: The Trials and Tribulations of a Good Idea," by Mark Wallace, 483-494. "Integrating Women and Active Learning into the U.S. History Survey," by Jennifer Frost, 363-370. Leary, Jr., John E., "World Crisis as 'Teachable Moment': Joining Global Issues, International Law, and the Internet in the Classroom," 321-333. Marcus, Robert D., "Nonreaders Anonymous: Reading History Collaboratively," 453-468. Matyn, Marian J., "Getting Undergraduates to Seek Primary Sources in Archives," 349-355. McCabe, Chica, coauthor, "Plat Maps as a History and Geography Teaching Tool," 153-173. McDaniel, Kathryn N., "Four Elements of Successful Historical Role-Playing in the Classroom," 357-362. Meo, Susan Leighow, "'In Their Own Eyes': Using Journals with Primary Sources with College Students," 335-341. "Model for Teaching Secondary History, A: The Case of Fort Pillow," by Paul Horton, 175-183. "Nonreaders Anonymous: Reading History Collaboratively," by Robert D. Marcus, 453-468. "Plat Maps as a History and Geography Teaching Tool," by Robert M. Ward and Chica McCabe, 153-173. "Reader's Journal in Lower-Division History Courses, The: A Strategy to Improve Reading, Writing and Discussion," by Andrew August, 343-348. "Teaching Students How to Be Historians: An Oral History Project for the Secondary School Classroom," by Glenn Whitman, 469-481. Wallace, Mark, "Integrating United States and World History in the High School Curriculum: The Trials and Tribulations of a Good Idea," 483-494. Ward, Robert M., coauthor, "Plat Maps as a History and Geography Teaching Tool," 153-173. Whitman, Glenn, "Teaching Students How to Be Historians: An Oral History Project for the Secondary School Classroom," 469-481. "World Crisis as 'Teachable Moment': Joining Global Issues, International Law, and the Internet in the Classroom," by John E. Leary, Jr., 321-333. "'Dad, What Did You Do During the War? ': A Postmodernist(?) Classroom Exercise," by Michael F. Palo, 193-212. "Great Historical Jeremiad, The: The Problem of Specialization in American Historiography," by Ian Tyrell, 371-393. Hutton, Patrick, "Recent Scholarship on Memory and History," 533-548. Palo, Michael F., "'Dad, What Did You Do During the War? ': A Postmodernist(?) Classroom Exercise," 193-212. "Recent Scholarship on Memory and History," by Patrick Hutton, 533-548. Tyrell, Ian, "The Great Historical Jeremiad: The Problem of Specialization in American Historiography," 371-393. Betterly, Jack, "Teaching Global History: Context, Not Chronicle; Passion, Not Pedantry," 213-219. Dunn, Ross E., "Making of a National Curriculum, The: The British Case," 395-398. "Making of a National Curriculum, The: The British Case," by Ross E. Dunn, 395-398. "Teaching Global History: Context, Not Chronicle; Passion, Not Pedantry," by Jack Betterly, 213-219. Stearns, Peter N., "Student Identities and World History Teaching," 185-192. "Student Identities and World History Teaching," by Peter N. Stearns, 185-192. Barron, Caroline, co-ed., England and the Low Countries in the Middle Ages, revd., 257-258. Berkeley, Kathleen C., The Women's Liberation Movement in America, revd., 399-400. Beyer, Janet, co-ed., The Great Depression: A Nation in Distress, revd., 115-116. Black, Jeremy, Eighteenth-Century Europe, 2nd ed., revd., 400-401. Blum, George P., The Rise of Fascism in Europe, revd., 260-261. Bowers, J.D., rev., Revolutionary America, 1763-1815: A Political History, by Francis D. Cogliano, 404-405. Bradley, Karen J., rev., Daily Life on the 19th-Century American Frontier, by Mary Ellen Jones, 258-260. Britain's Century: A Political and Social History, 1815-1905, by W.D. Rubinstein, revd., 553-554. Britnell, Richard, ed., Daily Life in the Late Middle Ages, revd., 401-403. Britton, John A., The United States and Latin America: A Select Bibliography, revd., 116-117. Brown, Jean E., co-auth., Learning About the Civil War: Literature and Other Resources for Young People, revd., 262-263. Brown, Judith M., co-ed., The Oxford History of the British Empire: Vol. IV, The Twentieth Century, revd., 403-404. Carson, Mina, rev., Forgotten Heroes: Inspiring American Portraits From Our Leading Historians, ed. by Susan Ware, 264-265. Cogliano, Francis D., Revolutionary America, 1763-1815: A Political History, revd., 404-405. Colbert, David, Eyewitness to the American West: 500 Years of Firsthand History, revd., 549-551. Cottrell, Robert C., rev., The Penguin Dictionary of Contemporary American History: 1945 to the Present, by Stanley Hochman and Eleanor Hochman, 119-120. Cregier, D.M., rev., Ireland: The 20th Century, by Charles Townshend, 263-264. Daily Life in the Late Middle Ages, ed. by Richard Britnell, revd., 401-403. Daily Life on the 19th-Century American Frontier, by Mary Ellen Jones, revd., 258-260. Edgerton, Keith, rev., Eyewitness to the American West: 500 Years of Firsthand History, by David Colbert, 549-551. Edgerton, Keith, rev., Native American Testimony (rev. ed. ), by Peter Nabokov, 549-551. Edwards, Cheryl, ed., Reconstruction: Binding the Wounds, revd., 117-118. Eighteenth-Century Europe, 2nd ed., by Jeremy Black, revd., 400-401. Emert, Phyllis Rabin, ed., Women in the Civil War: Warriors, Patriots, Nurses, and Spies, revd., 117-118. England and the Low Countries in the Middle Ages, ed. by Caroline Barron and Nigel Saul, revd., 257-258. Eyewitness to the American West: 500 Years of Firsthand History, by David Colbert, revd., 549-551. Five Epochs of Civilization: World History as Emerging in Five Civilizations, by William McGauhey, revd., 551-552. Forgotten Heroes: Inspiring American Portraits From Our Leading Historians, ed. by Susan Ware, revd., 264-265. Good Citizen, The: A History of American Civic Life, by Michael Schudson, revd., 261-262. Great Depression, The: A Nation in Distress, ed. by Janet Beyer and JoAnne B. Weisman, revd., 115-116. Harrod, Christopher B., rev., Learning About the Civil War: Literature and Other Resources for Young People, by Elaine C. Stephens and Jean E. Brown, 262-263. Hirschhorn, Bernard, rev., The Great Depression: A Nation in Distress, ed. by Janet Beyer and JoAnne B. Weisman, 115-116. Hochman, Eleanor, The Penguin Dictionary of Contemporary American History: 1945 to the Present, revd., 119-120. Hochman, Stanley, co-auth., The Penguin Dictionary of Contemporary American History: 1945 to the Present, revd., 119-120. Ireland: The 20th Century, by Charles Townshend, revd., 263-264. Iversen, Joan Smythe, rev., The Women's Liberation Movement in America, by Kathleen C. Berkeley, 399-400. Jones, Mary Ellen, Daily Life on the 19th-Century American Frontier, revd., 258-260. Knox, Lezlé rev., Daily Life in the Late Middle Ages, ed. by Richard Britnell, 401-403. Laqueur, Thomas W., rev., Britain's Century: A Political and Social History, 1815-1905, by W.D. Rubinstein, 553-554. Learning About the Civil War: Literature and Other Resources for Young People, by Elaine C. Stephens and Jean E. Brown, revd., 262-263. Louis, Wm. Roger, co-ed., The Oxford History of the British Empire: Vol. IV, The Twentieth Century, revd., 403-404. McGauhey, William, Five Epochs of Civilization: World History as Emerging in Five Civilizations, revd., 551-552. McKee, Jim, rev., The Good Citizen: A History of American Civic Life, by Michael Schudson, 261-262. McLeod, Jonathan, rev., Reconstruction: Binding the Wounds, ed. by Cheryl Edwards, 117-118. McLeod, Jonathan, rev., Women in the Civil War: Warriors, Patriots, Nurses, and Spies, ed. by Phyllis Rabin Emert, 117-118. Nabokov, Peter, Native American Testimony (rev. ed. ), revd., 549-551. Native American Testimony (rev. ed. ), by Peter Nabokov, revd., 549-551. Oxford History of the British Empire, The: Vol. IV, The Twentieth Century, ed. by Judith M. Brown and Wm. Roger Louis, revd., 403-404. Penguin Dictionary of Contemporary American History, The: 1945 to the Present, by Stanley Hochman and Eleanor Hochman, revd., 119-120. Reconstruction: Binding the Wounds, ed. by Cheryl Edwards, revd., 117-118. Revolutionary America, 1763-1815: A Political History, by Francis D. Cogliano, revd., 404-405. Richards, Michael D., co-auth., Twentieth Century Europe: A Brief History, revd., 552-553. Riley, Philip F., rev., Five Epochs of Civilization: World History as Emerging in Five Civilizations, by William McGauhey, 551-552. Rise of Fascism in Europe, The, by George P. Blum, revd., 260-261. Rosenthal, Joel T., rev., England and the Low Countries in the Middle Ages, ed. by Caroline Barron and Nigel Saul, 257-258. Rubinstein, W.D., Britain's Century: A Political and Social History, 1815-1905, revd., 553-554. Saul, Nigel, co-ed., England and the Low Countries in the Middle Ages, revd., 257-258. Schudson, Michael, The Good Citizen: A History of American Civic Life, revd., 261-262. Schue, Paul, rev., The Rise of Fascism in Europe, by George P. Blum, 260-261. Spencer, Thomas T., rev., Twentieth Century Europe: A Brief History, by Michael D. Richards and Paul R. Waibel, 552-553. Stephens, Elaine C., co-auth., Learning About the Civil War: Literature and Other Resources for Young People, revd., 262-263. Townshend, Charles, Ireland: The 20th Century, revd., 263-264. Twentieth Century Europe: A Brief History, by Michael D. Richards and Paul R. Waibel, revd., 552-553. United States and Latin America, The: A Select Bibliography, by John A. Britton, revd., 116-117. Waibel, Paul R., co-auth., Twentieth Century Europe: A Brief History, revd., 552-553. Ward, Joseph P., rev., Eighteenth-Century Europe, 2nd ed., by Jeremy Black, 400-401. Ware, Susan, ed., Forgotten Heroes: Inspiring American Portraits From Our Leading Historians, revd., 264-265. Weisman, JoAnne B., co-ed., The Great Depression: A Nation in Distress, revd., 115-116. Weisser, Henry, rev., The Oxford History of the British Empire: Vol. IV, The Twentieth Century, ed. by Judith M. Brown and Wm. Roger Louis, 403-404. Wells, Allen, rev., The United States and Latin America: A Select Bibliography, by John A. Britton, 116-117. Women in the Civil War: Warriors, Patriots, Nurses, and Spies, ed. by Phyllis Rabin Emert, revd., 117-118. Women's Liberation Movement in America, The, by Kathleen C. Berkeley, revd., 399-400. A Hard Fight for We: Women's Transition from Slavery to Freedom in South Carolina, by Leslie A. Schwalm, revd., 138-139. A Passion for the Past, by James A. Percoco, revd., 563-564. A Woman in Amber: Healing the Trauma of War and Exile, by Agate Nesaule, revd., 276-277. Abels, Richard, Alfred the Great: War, Kingship and Culture in Anglo-Saxon England, revd., 555-556. Abrams, Ann Ahry, The Pilgrims and Pocahontas: Rival Myths of American Origin, revd., 266-267. Alfred the Great: War, Kingship and Culture in Anglo-Saxon England, by Richard Abels, revd., 555-556. America and the Great War, 1914-1920, by D. Clayton James and Anne Sharp Wells, revd., 405-406. Arnstein, Walter L., rev., The Mid-Victorian Generation, 1846-1886, by K. Theodore Hoppen, 130-131. Baltic Nations and Europe, The: Estonia, Latvia and Lithuania in the Twentieth Century, by John Hiden and Patrick Salmon, revd., 129. Bane, Steven Kirk, rev., The New History in an Old Museum: Creating the Past at Colonial Williamsburg, by Richard Handler and Eric Gable, 128. Beach, The: A History of Paradise on Earth, by Lena Lencek and Gideon Bosker, revd., 408-409. Beardan, Patricia, co-auth., History Comes Home: Family Stories Across the Curriculum, revd., 410-411. Bell, P.M.H., The Origins of the Second World War in Europe, revd., 120-121. Bellot, Leland J., rev., Politics, War, and Empire: The Rise of Britain to a World Power, 1688-1792, by Earl A. Reitan, 137-138. Bender, Eileen T., co-auth., More Quick Hits: Successful Strategies by Award-Winning Teachers, revd., 280-281. Berghahn, Volker R., Imperial Germany, 1871-1914: Economy, Society, Culture, and Politics, revd., 121-122. Black Flag: Guerilla Warfare on the Western Border, 1861-1865, by Thomas Goodrich, revd., 556-557. Black Leadership: Four Great American Leaders and the Struggle for Civil Rights, by Manning Marable, revd., 274-275. Bonn Republic, The: West German Democracy, 1945-1990, by A.J. Nicholls, revd., 277-279. Bosker, Gideon, The Beach: A History of Paradise on Earth, revd., 408-409. Bosnia: A Short Story, by Noel Malcolm, revd., 136-137. Bruffee, Kenneth A., ed., Collaborative Learning: Higher Education, Interdependence, and the Authority of Knowledge, 2nd., revd., 267-268. Burbank, Jane, co-ed., Imperial Russia: New Histories for the Empire, revd., 123-124. Burrell, Brian, The Words We Live By: The Creeds, Mottoes, and Pledges That Have Shaped America, revd., 124-125. Carey, Gabriele G., rev., Nature's Bounty: Historical and Modern Environmental Perspectives, by Anthony N. Penna, 562-563. Cayton, Andrew R.L., Frontier Indiana, revd., 125-126. Chew, Richard S., rev., Slavery, Freedom & Culture Among Early American Workers, by Graham Russell Hodges, 558-559. Clark, Charles E., rev., The Baltic Nations and Europe: Estonia, Latvia and Lithuania in the Twentieth Century, by John Hiden and Patrick Salmon, 129. Clinton, Catherine, co-ed., Taking Off the White Gloves: Southern Women and Women Historians, revd., 269-270. Cody, Lisa Forman, rev., Women in Early Modern England, 1550-1720, by Sara Mendelson and Patricia Crawford, 275-276. Collaborative Learning: Higher Education, Interdependence, and the Authority of Knowledge, 2nd., ed. by Kenneth A. Bruffee, revd. 267-268. Conceived in Liberty: Joshua Chamberlain, William Oates, and the American Civil War, by Mark Perry, revd., 279-280. Cookman, Claude H., co-auth., More Quick Hits: Successful Strategies by Award-Winning Teachers, revd., 280-281. Crawford, Patricia, co-auth., Women in Early Modern England, 1550-1720, revd., 275-276. Culture and Customs of Argentina, by David William Foster, Melissa Fitch Lockhart, and Darrell B. Lockhart, revd., 268-269. Democracy Reformed: Richard Spencer Childs and His Fight for Better Government, by Bernard Hirschhorn, revd., 557-558. Discenza, Nicole Guenther, rev., Alfred the Great: War, Kingship and Culture in Anglo-Saxon England, by Richard Abels, 555-556. Dreyfus Affair, The: Honour and Politics in the Belle Epoque, by Martin P. Johnson, revd., 406-407. Egerton, Douglas R., rev., The Pilgrims and Pocahontas: Rival Myths of American Origin, by Ann Ahry Abrams, 266-267. Foster, David William, co-auth., Culture and Customs of Argentina, revd., 268-269. Frontier Indiana, by Andrew R.L. Cayton, revd., 125-126. Gable, Eric, co-auth., The New History in an Old Museum: Creating the Past at Colonial Williamsburg, revd., 128. Gilbert, Bentley B., rev., The Origins of the Second World War in Europe, by P.M.H. Bell, 120-121. Gillespie, Michelle, co-ed., Taking Off the White Gloves: Southern Women and Women Historians, revd., 269-270. Goodrich, Thomas, Black Flag: Guerilla Warfare on the Western Border, 1861-1865, revd., 556-557. Haigh, Christopher, Profiles in Power: Elizabeth I, revd., 127-128. Haller, Evelyn, rev., A Woman in Amber: Healing the Trauma of War and Exile, by Agate Nesaule, 276-277. Hamilton, Carolyn, Terrific Majesty: The Powers of Shaka Zulu and the Limits of Historical Invention, revd., 271-272. Handler, Richard, co-auth., The New History in an Old Museum: Creating the Past at Colonial Williamsburg, revd., 128. Harrod, Christopher, rev., Black Flag: Guerilla Warfare on the Western Border, 1861-1865, by Thomas Goodrich, 556-557. Haynes, John Earlt, co-auth., Venona: Decoding Soviet Espionage in America, revd., 272-273. Hiden, John, co-auth., The Baltic Nations and Europe: Estonia, Latvia and Lithuania in the Twentieth Century, revd., 129. Hirschhorn, Bernard, Democracy Reformed: Richard Spencer Childs and His Fight for Better Government, revd., 557-558. History Comes Home: Family Stories Across the Curriculum, by Steven Zemelman, Patricia Beardan, Yolanda Simmons, and Pete Leki, revd., 410-411. History Workshop: Reconstructing the Past with Elementary Students, by Karen L. Jorgensen, revd., 561-562. Hodges, Graham Russell, Slavery, Freedom & Culture Among Early American Workers, revd., 558-559. Hopkins, Jerry, rev., The Words We Live By: The Creeds, Mottoes, and Pledges That Have Shaped America, by Brian Burrell, 124-125. Hoppen, K. Theodore, The Mid-Victorian Generation, 1846-1886, revd., 130-131. Horton, Paul, rev., Lewis Hayden and the War Against Slavery, by Joel Strangis, 281-283. Hurt, Douglas, The Ohio Frontier: Crucible of the Old Northwest, 1720-1830, revd., 131-132. Imperial Germany, 1871-1914: Economy, Society, Culture, and Politics, by Volker R. Berghahn, revd., 121-122. Imperial Russia: New Histories for the Empire, ed. by Jane Burbank and David L. Ransel, revd., 123-124. Iversen, Joan Smyth, rev., Taking Off the White Gloves: Southern Women and Women Historians, ed. by Michelle Gillespie and Catherine Clinton, 269-270. Jacoby, Daniel, Laboring for Freedom: A New Look at the History of Labor in America, revd., 559-560. James, D. Clayton, co-auth., America and the Great War, 1914-1920, revd., 405-406. Johnson, Martin P., The Dreyfus Affair: Honour and Politics in the Belle Epoque, revd., 406-407. Jorgensen, Karen L., History Workshop: Reconstructing the Past with Elementary Students, revd., 561-562. Keefe, Thomas M., rev., Imperial Germany, 1871-1914: Economy, Society, Culture, and Politics, by Volker R. Berghahn, 121-122. Keefe, Thomas M., rev., The Bonn Republic: West German Democracy, 1945-1990, by A.J. Nicholls, 277-279. Keller, Clair W., rev., History Comes Home: Family Stories Across the Curriculum, by Steven Zemelman, Patricia Beardan, Yolanda Simmons, and Pete Leki, 410-411. Kirk, Tim, The Longman Companion to Nazi Germany, revd., 132-133. Klehr, Harvey, co-auth., Venona: Decoding Soviet Espionage in America, revd., 272-273. Kramer, Lloyd, Nationalism, revd., 133-134. Laboring for Freedom: A New Look at the History of Labor in America, by Daniel Jacoby, revd., 559-560. Leki, Pete, co-auth., History Comes Home: Family Stories Across the Curriculum, revd., 410-411. Lencek, Lena, co-auth., The Beach: A History of Paradise on Earth, revd., 408-409. Lewis Hayden and the War Against Slavery, by Joel Strangis, revd., 281-283. Linenthal, Edward T., Preserving Memory: The Struggle to Create America's Holocaust Museum, revd., 134-136. Lockhart, Darrell B., co-auth., Culture and Customs of Argentina, revd., 268-269. Lockhart, Melissa Fitch, co-auth., Culture and Customs of Argentina, revd., 268-269. Longman Companion to Nazi Germany, The, by Tim Kirk, revd., 132-133. Malcolm, Noel, Bosnia: A Short Story, revd., 136-137. Marable, Manning, Black Leadership: Four Great American Leaders and the Struggle for Civil Rights, revd., 274-275. Mendelson, Sara, co-auth., Women in Early Modern England, 1550-1720, revd., 275-276. Messer-Kruse, Timothy, rev., Laboring for Freedom: A New Look at the History of Labor in America, by Daniel Jacoby, 559-560. Mid-Victorian Generation, The, 1846-1886, by K. Theodore Hoppen, revd., 130-131. Monas, Sidney, rev., Nationalism, by Lloyd Kramer, 133-134. Monteón, Michael, rev., Culture and Customs of Argentina, by David William Foster, Melissa Fitch Lockhart, and Darrell B. Lockhart, 268-269. More Quick Hits: Successful Strategies by Award-Winning Teachers, by S. Holly Stocking, Eileen T. Bender, Claude H. Cookman, J. Vincent Peterson, and Robert B. Votaw, revd., 280-281. Muggleston, William F., rev., A Hard Fight for We: Women's Transition from Slavery to Freedom in South Carolina, by Leslie A. Schwalm, 138-139. Mugleston, William F., rev., Black Leadership: Four Great American Leaders and the Struggle for Civil Rights, by Manning Marable, 274-275. Nationalism, by Lloyd Kramer, revd., 133-134. Nature's Bounty: Historical and Modern Environmental Perspectives, by Anthony N. Penna, revd., 562-563. Nayenga, Peter F.B., rev., Terrific Majesty: The Powers of Shaka Zulu and the Limits of Historical Invention, by Carolyn Hamilton, 271-272. Nesaule, Agate, A Woman in Amber: Healing the Trauma of War and Exile, revd., 276-277. New History in an Old Museum, The: Creating the Past at Colonial Williamsburg, by Richard Handler and Eric Gable, revd., 128. Nicholls, A.J., The Bonn Republic: West German Democracy, 1945-1990, revd., 277-279. Nore, Ellen, rev., Democracy Reformed: Richard Spencer Childs and His Fight for Better Government, by Bernard Hirschhorn, 557-558. Ohio Frontier, The: Crucible of the Old Northwest, 1720-1830, by Douglas Hurt, revd., 131-132. Origins of the Second World War in Europe, The, by P.M.H. Bell, revd., 120-121. Penna, Anthony N., Nature's Bounty: Historical and Modern Environmental Perspectives, revd., 562-563. Percoco, James A., A Passion for the Past, revd., 563-564. Perry, Mark, Conceived in Liberty: Joshua Chamberlain, William Oates, and the American Civil War, revd., 279-280. Peterson, J. Vincent, co-auth., More Quick Hits: Successful Strategies by Award-Winning Teachers, revd., 280-281. Pilgrims and Pocahontas, The: Rival Myths of American Origin, by Ann Ahry Abrams, revd., 266-267. Pocock, Emil, rev., Frontier Indiana, by Andrew R.L. Cayton, 125-126. Pois, Robert A. , rev., The Longman Companion to Nazi Germany, by Tim Kirk, 132-133. Politics, War, and Empire: The Rise of Britain to a World Power, 1688-1792, by Earl A. Reitan, revd., 137-138. Preserving Memory: The Struggle to Create America's Holocaust Museum, by Edward T. Linenthal, revd., 134-136. Profiles in Power: Elizabeth I, by Christopher Haigh, revd., 127-128. Ramusack, Barbara N., co-auth., Restoring Women to History: Women in Asia, revd., 409-410. Ransel, David L., co-ed., Imperial Russia: New Histories for the Empire, revd., 123-124. Redinger, Matthew, rev., The Beach: A History of Paradise on Earth, by Lena Lencek and Gideon Bosker, 408-409. Reitan, Earl A., Politics, War, and Empire: The Rise of Britain to a World Power, 1688-1792, revd., 137-138. Restoring Women to History: Women in Asia, by Barbara N. Ramusack and Sharon Sievers, revd., 409-410. Ruddy, T. Michael, rev., Venona: Decoding Soviet Espionage in America, by John Earlt Haynes and Harvey Klehr, 272-273. Salmon, Patrick, co-auth., The Baltic Nations and Europe: Estonia, Latvia and Lithuania in the Twentieth Century, revd., 129. Schwalm, Leslie A., A Hard Fight for We: Women's Transition from Slavery to Freedom in South Carolina, revd., 138-139. Scott, John Anthony, rev., Collaborative Learning: Higher Education, Interdependence, and the Authority of Knowledge, 2nd. ed., by Kenneth A. Bruffee, 267-268. Shedd, John A., rev., A Passion for the Past, by James A. Percoco, 563-564. Shedd, John A., rev., History Workshop: Reconstructing the Past with Elementary Students, by Karen L. Jorgensen, 561-562. Sievers, Sharon, co-auth., Restoring Women to History: Women in Asia, revd., 409-410. Simmons, Yolanda, co-auth., History Comes Home: Family Stories Across the Curriculum, revd., 410-411. Slavery, Freedom & Culture Among Early American Workers, by Graham Russell Hodges, revd., 558-559. Stocking, S. Holly, co-auth., More Quick Hits: Successful Strategies by Award-Winning Teachers, revd., 280-281. Strangis, Joel, Lewis Hayden and the War Against Slavery, revd., 281-283. Taking Off the White Gloves: Southern Women and Women Historians, ed. by Michelle Gil-lespie and Catherine Clinton, revd., 269-270. Tamura, Eileen H. , rev., More Quick Hits: Successful Strategies by Award-Winning Teachers, by S. Holly Stocking, Eileen T. Bender, Claude H. Cookman, J. Vincent Peterson, and Robert B. Votaw, 280-281. Terrific Majesty: The Powers of Shaka Zulu and the Limits of Historical Invention, by Carolyn Hamilton, revd., 271-272. Totten, Samuel, rev., Preserving Memory: The Struggle to Create America's Holocaust Museum, by Edward T. Linenthal, 134-136. Venona: Decoding Soviet Espionage in America, by John Earlt Haynes and Harvey Klehr, revd., 272-273. Vieira, Michael A., rev., America and the Great War, 1914-1920, by D. Clayton James and Anne Sharp Wells, 405-406. Votaw, Robert B., co-auth., More Quick Hits: Successful Strategies by Award-Winning Teachers, revd., 280-281. Wasson, Ellis Archer, rev., Profiles in Power: Elizabeth I, by Christopher Haigh, 127-128. Waugh, Joan, rev., Conceived in Liberty: Joshua Chamberlain, William Oates, and the American Civil War, by Mark Perry, 279-280. Wells, Anne Sharp, co-auth., America and the Great War, 1914-1920, revd., 405-406. Whited, Tamara L., rev., The Dreyfus Affair: Honour and Politics in the Belle Epoque, by Martin P. Johnson, 406-407. Women in Early Modern England, 1550-1720, by Sara Mendelson and Patricia Crawford, revd., 275-276. Woo-Sam, Anne, rev., The Ohio Frontier: Crucible of the Old Northwest, 1720-1830, by Douglas Hurt, 131-132. Words We Live By, The: The Creeds, Mottoes, and Pledges That Have Shaped America, by Brian Burrell, revd., 124-125. Yasutake, Rumi, rev., Restoring Women to History: Women in Asia, by Barbara N. Ramusack and Sharon Sievers, 409-410. Zemelman, Steven, co-auth., History Comes Home: Family Stories Across the Curriculum, revd., 410-411. Zlatar, Zdenko, rev., Bosnia: A Short Story, by Noel Malcolm, 136-137. Znamenski, Andrei A., rev., Imperial Russia: New Histories for the Empire, ed. by Jane Burbank and David L. Ransel, 123-124.